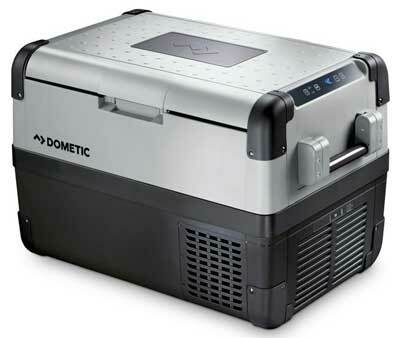 Dometic makes several portable electric fridge-freezers, ranging from the 28-liter size to the 95-liter size. This 50-liter model (or CFX-50) can carry plenty of food and drinks, while at the same time keeps its size manageable. It cools the interior contents quickly without using a lot of energy. Therefore, you can keep operating costs low and save money. Dometic’s energy efficiency allows you to run the fridge freezer off of solar panels. The unit runs quietly, which makes it ideal for using inside a van or RV. The rugged, durable construction makes it the perfect companion for outdoor excursions where you don’t want to worry about having to babysit your cooler. Of course, I also like the fact that you can run this appliance as either a portable refrigerator or freezer. And, that you don’t need to buy ice. I also like the convenient built-in USB port that they added to this latest model. Not to mention the 3-stage battery protection, so you don’t accidentally kill your vehicle battery while chilling your drinks. Plus, the dual power cables allow you to use your portable cooler at home or at the office in addition to your vehicle. In other words, you can use this fridge/freezer virtually anywhere without having to buy multiple coolers. In short, the CFX 50 is a newer (and improved) version of the CF 50 electric cooler. It has thicker insulation, better cooling performance and with less power consumption. In addition, Dometic added more electronics and convenient features. For example, a USB Port, wireless display accessory, drop-down handles, corner protectors and more. By the way, the “W” in CFX 50W (VS CFX 50) stands for Wifi. In other words, the “W” models give you the convenient option of controlling and monitoring the cooling temperature with a WiFi app. Even though Dometic coolers operate very efficiently with high-quality insulation, you can add even more insulating power to your fridge/freezer. 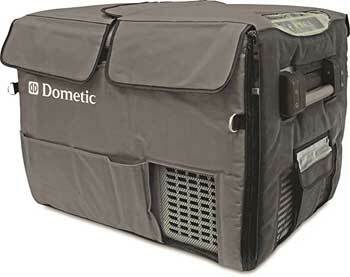 In fact, you can get a custom fit Dometic insulated protective cover that wraps snugly around your cooler. If you use your cooler outdoors in sun or wind, you may want to consider this option. Basically, the cover helps save more battery power while keeping the interior contents cooler. Over the long run, you can save money on operating costs. Plus, the cover protects the unit from dirt and dust too. Do you have questions about unit specifications, parts and accessories or cleaning/maintenance? I recommend checking out the Operating Manual, which has 32 pages of instructions, diagrams and technical data. 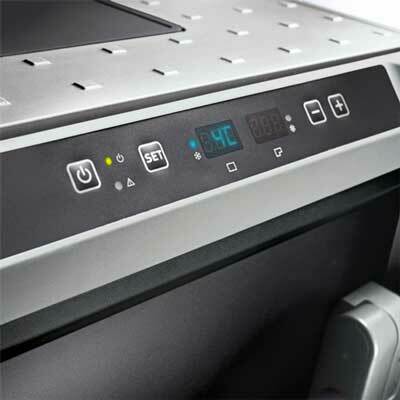 It also includes energy saving tips, a troubleshooting guide, defrosting instructions and how to use the battery monitor. You can download it for free online. In the compressor fridge review below, we see how the unit works, including power consumption off of a solar panel. It cools the interior contents quickly and surprisingly operates with very little sound. Do you camp in a van or other recreational vehicle and use solar panels to generate power? You may really like this compact portable cooler/fridge/freezer because it runs very efficiently without making a lot of noise. If you are shopping for a portable electric cooler, you may want to compare different makes and models so you can get the best price. Our minds think alike, because I already did some comparing myself. 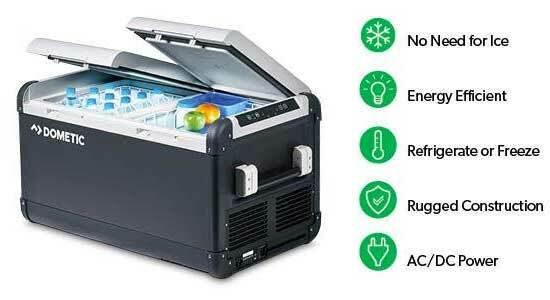 Essentially, the Dometic CFA50X, the ARB 50-Quart Fridge/Freezer and the Engel 43 Quart have almost identical dimensions, power consumption, cooling capabilities and features. In addition, when I did a price check, all models fell within about $100 of each other. Currently, the Engel has the lowest price. However, it has a slightly smaller size. The youtube video below compares several different 12V compressor fridge/freezers including Dometic and Whynter models. Fits conveniently between car seats. Tall enough to hold 2-Liter bottles. Costway Portable Fridge Freezer – How Does it Compare? carrying handle. 26 Quart capacity.